I have been WANTING this amazing yarn for a while; ever since my trip home in January to see my dad for the last time - I think I was in Memphis in the airport waiting for my next flight, when I was digging through a magazine and discovered a plethora of classified ads raving about this fiber. I knew that surely I'd be able to find some of this stuff in Los Angeles when I got home, so I ripped out an ad and stuffed it into my backpack. I called one of the suppliers in the magazine to try to find out the cost... it's expensive! I HAD to at least see and fall in love with the fiber before buying it - so I waited. I went to see Suzan Mischer of Knit Cafe after that trip and asked her about a ribbed hat pattern I have been searching for - she was really helpful (and she has the most beautiful store I think I have ever seen!) but we weren't able to come up with a pattern. It's OK though; I have put that project on the "back burner" for now... too many more exciting things to think about!... Anyway, I also mentioned this fiber, and not only did she know about it, she had seen it at the recent show and ordered it! It was going to take a while to arrive, she mentioned... so I waited. Time passed till yesterday, when I was looking for the Debbie Bliss Sublime Baby book - I'm working on something out of the book and decided I want to own the book instead of just borrowing my friends copy.... and I thought that Knit Cafe might have the book... they didn't. but they DID have my Quiviuk! I didn't spring for the 100% pure yarn for two reasons - first, it was REALLY expensive - ( I think it was around $75 per ball) and it was really "fluffy" - I wanted to be sure that I loved the thing I made out of this yarn if I was springing for something this rare... 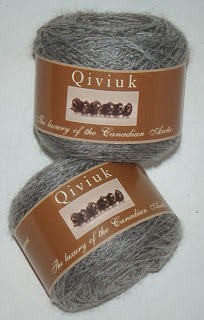 I bought the 45% Quiviuk, 45% Extrafine Merino, 10% silk - and it was about $50 a ball - I wasn't going to say anything about the cost because I didn't want anyone to admonish me for spending so much on yarn - but I decided that I had a tiny bit of extra money from the second job I just left, and that this would be the thing I was buying as a reward for my hard work and efforts. I'm sure it will be a one time thing; this purchasing way over the top yarn - while I'm a huge fan of fine materials for my knitting, I can't be spending money like this!!! eek. I haven't figured out if it'll work yet, but I think the little cables in the pattern I got yesterday may be a little too much for my style - I love the simplicity of the yarn and the fiber itsself should be the "star" - so I am most likely to dive into Jesse's pattern before doing cables with this stuff. 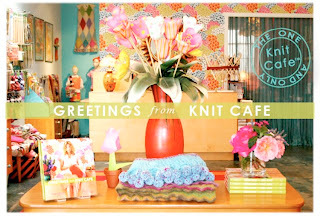 Go to www.knitcafe.com and if you're in the area, swing by Suzan's shop - it's beautiful and stocked to the brim with amazing yarns and supplies. Thought I'd say howdy and thanks for your comment on my scarf disaster! I have tried to knit the halfdome and failed but I don't believe it is the pattern's fault. It should be an easy knit and I love its simplicity. I agree that a pattern that lets the yarn do the talking is the way to go with such a special purchase. Have you been to the designer's site (yarnboy.com)? He made another halfdome that is black with a brown (or maybe gray) rolled brim that really looks sharp. Maybe you could turn it around and make a black brim for yours.